CPR Educators offers CPR certification, AED Training, and first aid training for businesses and residents in Greenville, NC. 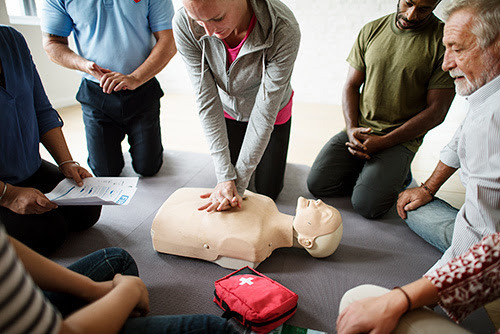 Our certified instructors are experienced in both teaching these life-saving skills and also using them practically in their careers as nurses, EMTs, firefighters, and other emergency service professions. Each instructor provides engaging, fun classes that combine classroom-style learning with active participation so students can pass the assessment with ease and also apply their knowledge to real scenarios. Why Take CPR Classes in Greenville? Many jobs require their employees to be certified in emergency response skills, including our AED, first aid, and CPR training course. However, the most important reason to take these classes is simple – these skills save lives. When the unthinkable happens, those minutes between calling for help and EMTs arriving to the scene are crucial. CPR and first aid can be literal difference between life and death. At CPR Educators, we’re dedicated to making sure our CPR-certified students are empowered with the knowledge and confidence necessary to take action when an emergency occurs. Whether it’s a serious accident, car wreck, or cardiac event, our students will know exactly how to step up and give aid. CPR Educators holds several courses in emergency training at our American Heart Association Authorized Training Center in Greenville, NC. We limit the size of our classes so our instructors can provide a more engaging experience with every student and offering hands-on practice to reinforce what they learn. Our goal is to make sure that students can easily pass the certification test while also feeling comfortable in their new abilities. The Pediatric First Aid CPR AED course is designed for child care workers and those who may be in a situation where they have to respond to a child’s health crisis. Students learn the skills necessary to respond to serious illness or injury until help arrives. The BLS class is the foundation for saving lives during a cardiac arrest scenario. Designed specifically for medical professionals including dental professionals, CNAs, and home health aids, students in this class learn basic life support skills to apply in healthcare and pre-hospital settings. This online blended learning course is an excellent option for students who prefer a self-paced class while still getting the opportunity to get hands-on, practical experience and assess their skills with a certified instructor. This OSHA-required course teaches students how to properly act and react to reduce exposure to bloodborne pathogens. This is designed for Greenville employees who have to meet OSHA Standard 1910.1030 regarding bloodborne pathogens. Our Greenville, NC training facility is conveniently located and our classes are available at a variety of times throughout the month. Our classes do fill quickly, so it is important to determine the right time that works best for your schedule and register quickly. We also are available for on-site first aid and CPR classes for businesses and organizations who need training for several employees at once. Our instructors will hold classes at your office or business and provide the same effective, in-depth instruction that we teach at our own training center. On-site CPR classes make it possible to ensure that all your employees have the same training, don’t miss out or let their certification lapse, and it even saves money! Ask us how we can customize our curriculum to your unique industry needs, such as for day care centers or dentists’ offices. Reach out to us today at (919) 639-4848, send us an email, or fill out our contact form to learn more about our emergency training classes and schedule on-site instruction!